UPDATE: I just returned from Lucca and the 2014 Matta & Lucca Italian School “Studycation”! I spent twelve wonderful days in the heart of the walled city of Lucca with an awesome group of women. We studied at Lucca Italian School in the mornings and in the afternoons we explored the city & Tuscany with our fantastic teachers. WHAT AN EXPERIENCE – one definitely that I will be repeating again in 2015! 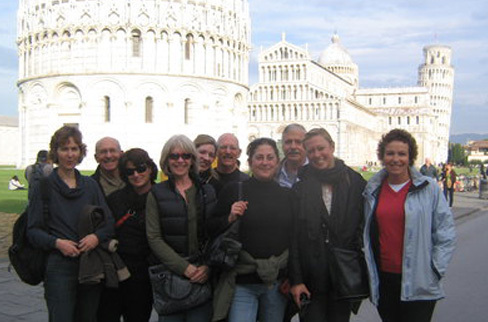 To Learn more about the NEXT 2015 Matta & Lucca Italian School Language Immersion: September 11 – 22 CLICK HERE! Want to PRACTICE & IMPROVE YOUR ITALIAN? Immersing yourself in language and culture and traveling with like minded individuals is an lovely way to learn the language and become fluent. Whether you are a beginner or an advanced student, if you are passionate about the Italian language you will enjoy this Immersion “Study-cation”! 2014 Matta & Lucca Italian Study-cation! The first week of June 2014 (June 1st-12th) you will find the Studentessa Matta in LUCCA Italy! I would like to invite you to join me to spend TEN days in Tuscany studying at Lucca Italian School, immersing in language & Italian culture! My friends & teachers at Lucca Italian school, Daniela, Angelo & Eva and I are planning the next Matta Language & Cultural Immersion trip in Italy and YOU ARE INVITED to join us! During our stay in Lucca we will study Italian in the mornings at Lucca Italian School & in the afternoons we will explore Lucca and surrounding hill towns. Look what we have in store: 2 cooking classes/preparing 5 course meals in local agriturismo/farm houses, guided tours of Lucca & Pisa & surrounding hill towns, wine & olive oil tastings, a bike excursion and picnic along the walls of Lucca AND tickets to a concert featuring arias by Puccini and other Italian composers, as well as plenty of free time to explore the city at your own pace! We have selected the lovely Piccolo Albergo Puccini, in the historic city center of Lucca where our group will reside during our stay in Lucca. 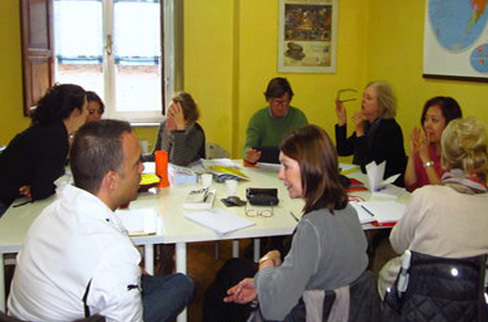 The Matta / Lucca Italian School – Language & Cultural Immersion will be a relaxing & enjoyable vacation, open to all levels of language learners. We welcome advanced as well as beginning students as well as any “significant others” who might not speak the language, but who want to experience Lucca’s amazing culture and cuisine. Listen to the teachers, Daniela, Angelo and Eva talk about our trip! They recorded this message for a recent Valentine’s day Podcast . Listen as they welcome you to participate in our Language Immersion trip and as they describe in Italian what we will do during our stay in Lucca! To Learn more about Lucca Italian School & it’s philosophy follow this link. Access Trip Forms: 1) Welcome/Registration, 2) Survey/Terms/Waiver, 3) Program Itinerary. Fill out the Registration & Survey Forms and submit with payment or deposit. Downloadable Matta/Lucca Italian School Flyer with 2014 trip highlights: To Share with your friends and Italian conversation groups. Fate passaparola! Spread the word! Grazie! Accommodations: We will be staying at Hotel Puccini, a 3 star hotel in the heart of Lucca’s historical center, in Piazza San Michele. Prices are based on double room occupancy. For a single room please add a single payment of $135 / 100E per person, to cover the entire week’s stay. Please see photos to the right. 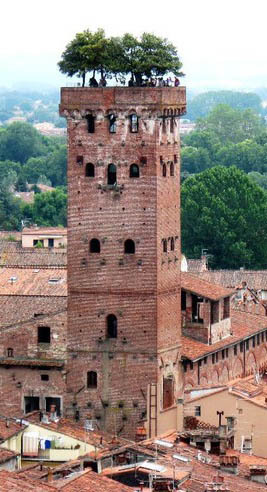 Kristen Theologus, a Matta blog reader and Facebook follower in 2012 spent a month studying at Lucca Italian School. 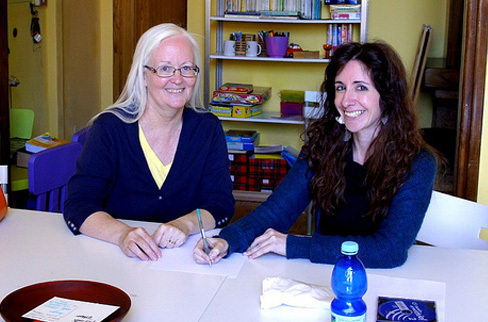 Kristen initially discovered Lucca Italian School through my blog. 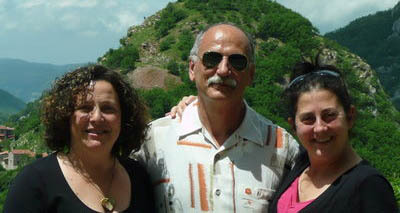 She writes: I spent April 2012 in Lucca taking private lessons with 3 fabulous teachers at LIS. Antonella, Laura and Daniela perfectly accommodated my learning style and schedule. It was a no stress learning environment where I thoroughly enjoyed the opportunity to practice speaking Italian everyday and refreshing some of my neglected Italian grammar. They were fantastic at helping me navigate shopping in Lucca and being an Italian movie lover, the school had a great library of films. In my opinion one could not pick a more perfect town than Lucca to experience an Italian immersion vacation. Monday, June 2nd: Festa Nazionale/National Holiday: School open only for our group. 3pm: Cooking Lesson in an agriturismo in the hills outside of Lucca followed by dinner. We will arrive by private bus. Transport to Lucca: The nearest airport is Pisa, which is about 30 minutes by car from Lucca. If you are coming from Pisa/Airport, we can arrange a private transport in a small bus that will accommodate up to 7 people for 80E. Florence is about a 1 hr drive by car from Lucca and we can also arrange a private transport in a small bus that will accommodate up to 7 people: 130E. If you arrive during the day from either location there are frequent train or bus connection with a cost of about 6/10E per peron. If you arrive after 8pm you must arrange for a private transport (see above). Please contact with your specific transport questions and we will be happy to help you with your travel arrangements. For more information and to make a reservation contact melissa@studentessamatta.com . Ci vediamo a Lucca!